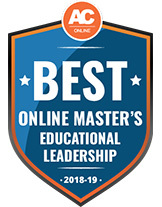 Stephen F. Austin State University's online master's degree in educational leadership has been named one of the best programs of its kind in the nation. AffordableCollegesOnline.org evaluated more than 3,500 colleges nationwide to find the best online master's degree in educational leadership and ranked SFA's program in the top 1 percent. NACOGDOCHES, Texas - Stephen F. Austin State University's online master's degree in educational leadership has been named one of the best programs of its kind in the nation. AffordableCollegesOnline.org, a website dedicated to helping prospective students find the best online programs, financial aid and major, evaluated more than 3,500 colleges nationwide to find the best online master's degree in educational leadership and ranked SFA's program in the top 1 percent. "We are encouraged by this recognition," said Dr. Jeanie Gresham, chair of SFA's Department of Secondary Education and Educational Leadership. "It spotlights the hard work of the program coordinator, Dr. Barbara Qualls, and other faculty members who diligently teach and mentor candidates for future leadership roles." Universities were ranked on affordability, quality, flexibility and degrees offered. SFA's 30-hour Master of Education in educational leadership leads to principal certification. Students who have completed a master's degree and meet other admission requirements can enroll in the 18-hour principal certification program. "In our seventh annual survey of online learning programs across the nation, we wanted to honor the colleges and universities that are providing innovative ways for students to complete a degree," said Dan Schuessler, CEO and founder of AffordableCollegesOnline.org. "These schools are going above and beyond the industry standard to help make online education programs more accessible and affordable." SFA's program engages students in data-driven decision-making, special programs, law, and school and community leadership. Students also have the opportunity to practice in the industry through field experiences and internships. For more information, visit sfaonline.info/educationalleadership.